Recreated from an “experiment in living” created by Jana Leo and Terry Williams in May of 2014. In that project, two strangers lived together 24-hours a day for three days — one participant, a paroled felon, acting as a voluntary prisoner of the other. Tickets can be purchased online here, or in advance at the gallery for $15. Ticket-holders will meet at INVISIBLE-EXPORTS and will then be escorted to the location of the play. There will be no late admittance. Please be prompt and arrive 15 minutes in advance. INVISIBLE-EXPORTS is located at 89 Eldridge Street, just south of Grand Street. For more information, call 212-226-5447 or email: info@invisible-exports.com. Anne & Que, Pet Prisoner is a theatrical situation staged within the four walls of a 450 square foot traditional Chinatown railroad apartment. The performance involves two characters, Anne and Que, operating in situ amidst a small audience of ten people. Anne, a do-gooder liberal, feels isolated from the world and deeply lonely. She encounters literature for a program that re-socializes prisoners within people’s private homes. She agrees to participate, adapts her apartment to bring a prisoner home, and is sent her “Pet Prisoner,” named Que. Que is only interested in money and in making an attempt at a life outside prison, but still, feels as though he doesn’t fit in anywhere. He’s clueless except in regard to his physicality, and even that is pure narcissism. Anne, a free citizen, is a prisoner to the virtual world; Que, a former real-world prisoner, is now more restrained by his own limitations; both are desperate to find some way to live in the present, but are worlds apart. Anne & Que and The Pet Prisoner (a program that joins penal and civil life) exist to help us realize both the absurdity of the current prison system, as well as of urban living. The script and performances present the questions: is it possible to form a relationship with another person as if they were your pet? Would it give you comfort? Can there be mutual respect without free will? Why do we imprison ourselves in our daily life? A play-like performance, this “happening” challenges traditional theater: it takes place in an actual apartment, the stage is gone, there is no seating and no barrier between the audience and the actors. Like prison, Anne & Que is in close quarters. 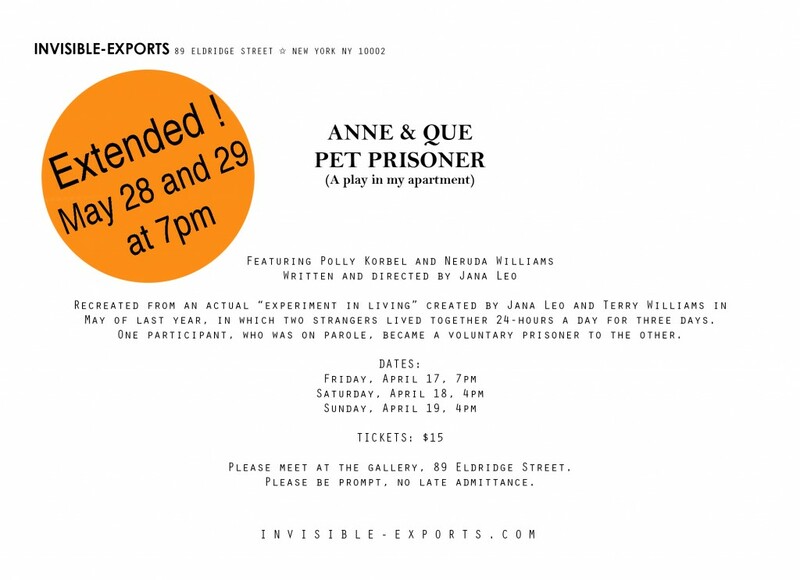 Anne and Que is based on the texts Pet Prisoner (2010-2013) and Experiment in Living (New York, 2014) by Jana Leo and Terry Williams. Corresponding video can be seen here.